This is the review of the 2013 event, you can also check out our full review of the 2014 race event and our Youtube video now! I needed to run this race. Correct that. I really needed to run this race. I had been training consistently all summer, when, in early August, the wheels came off. I am not really sure what happened or how it happened, but some minor foot pain had progressed into the worst back pain I had ever felt in my life. My doctor diagnosed me with a minor stress fracture in my foot and then a pulled muscle in my lower back that resulted from compensating for the pain. Then came the worst news: mandatory rest for pretty much the entire month of August (I had already been on self-imposed rest before I finally broke down and begrudgingly agreed to go see the doctor). By Labor Day I was crawling up the freakin walls. Not being able to run was starting to kill me, so I began to gradually ramp my training back up. My sister and brother-in-law live in Erie, PA and were expecting their first child. They were having a party to learn the gender of their baby – the big reveal was staged so that when you slice the cake, blue icing would mean they were having a boy, pink icing would mean they were having a girl – the day before the race, so they encouraged me to enter it since I was going to be visiting Erie anyway. One week before the race I went out for a run with my friend Melissa (who was training for her first marathon) with one simple challenge: if I could hang with her for 10 miles, I would enter the race. I hung with her for 11, so I went home and signed up for the race. I admittedly knew nothing about the event or what to expect, I just knew that I wanted to get out and run a race, and this one fit my schedule perfectly. This definitely goes under the do-not-try-this-one-at-home category. I knew going into the race that I would be undertrained because of my injury-imposed layoff, but I wasn’t prepared for what was about to happen. I went for my customary 5k shakeout run the day before the race, and all was good…until….with about 200 yards to go, I turned my right ankle when I mis-planted my foot, and it hurt, a lot. I mean, it hurt A LOT. I fell to the ground and hit so hard that I learned what it meant to have the wind knocked out of you. It took a few moments, but I picked myself up and slowly made my way back to my car and drove home. By the time I got out of the shower, my ankle was throbbing and I could barely walk. Fortunately I was driving up to Erie with my parents, so I was able to spread out on the backseat of their car and begin a RICE regiment – rest, ice, compression, elevation – all the way up to Erie. After the time I was forced to take off from running due to injury, there was no way I was missing out on this race. There was not so much an expo as a packet pickup. The biggest problem was walking from the car to the pavilion where the packet pickup was because, at this point, the pain in my ankle was pretty intense. Packet pickup was efficient and the volunteers were friendly, helpful, and expedient. What struck me the most was how this event had a small town feel to it: volunteers were busying themselves setting up for the pasta party that evening just as you would see at a local church picnic or VFW hall. There was something just nice and simple about the whole thing. This was accentuated by the beautiful autumn weather and the park setting of it all. The race shirt was a long-sleeved shirt with an autumn scene on it. It wasn’t really my style, but both my mom and sister really liked it (my sister won out, there was no way my mom was going to tell her “no” since she was about to give her another grandchild). The swag bag also included a nice pair of customized running socks and a “13.1” sticker for my car window, which were a nice touch. The starting area. This picture really does not do justice for just how perfect of a day it was for race around Presque Isle State Park. I learned my lesson about over-dressing for races, so for the first time I planned on going with a Champion tech fabric tank top for a race instead of short sleeves, which I noticed were significantly warmer than I would expect them to me. I also opted for a pair of compression shorts, running shorts, moisture wicking socks, and my Nike wrist bands and head band. For my feet I wore New Balance Minimus running shoes and topped the ensemble off with a compression sleeve I picked up the day before my injured ankle. I customized a new race-specific playlist and loaded it to IPhone which I decided to protect with a super-fancy and sophisticated Ziploc bag. For earphones I would be using my Yurbud Ironman Series headphones. I woke up the morning of the race with a healthy amount of fear concerning what condition my ankle would be in. I gingerly placed my foot on the floor to test it out. It was stiff but was not as bad as I had expected. I went about my usual race morning routine. The breakfast I pre-selected was cheese and crackers, Chex Mix, and a 32 ounce Gatorade, which was about all my stomach could handle that morning. By the time I was ready and out the door, my ankle was feeling pretty non-threatening. It took me about 20 minutes to drive to the entrance of Presque Isle State Park. The volunteers did a great job of managing traffic flow onto the peninsula. It was crowded and congested, but they kept things moving. I was directed into a parking lot – it was still dark and the lots were not lit as they typically close at night, but there was just enough daylight to make it manageable. When I got out of the car, my ankle was throbbing, the time spent in the car driving was just enough to stiffen it up, so I had no choice but to walk it off and hope for the best. As this was a quintessential local race, there was not much in terms of pre-race festivities. One of the event’s claims to fame is that it qualifies a higher percentage of entrants for the Boston Marathon than other races as it is a flat and fast course (or so I am told, as the word “fast” is not in my vocabulary). As a result, there were many serious runners limbering up before the start. As it would be a mass start for all runners of all events (full marathon, half marathon, and race walker division), I decided to hang near the back and let the serious runners have their fun. Normally I do not like mass starts, especially when they do not have pacing groups for runners to self-select their starting positions, but for some reason it did not bother me on this day. 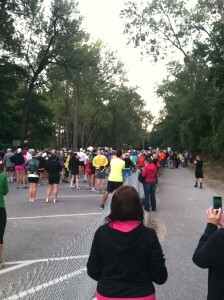 If you feed off of large crowds along the course, this is not the race for you. However, if you like wooded courses and picturesque vistas, this is the event for you. 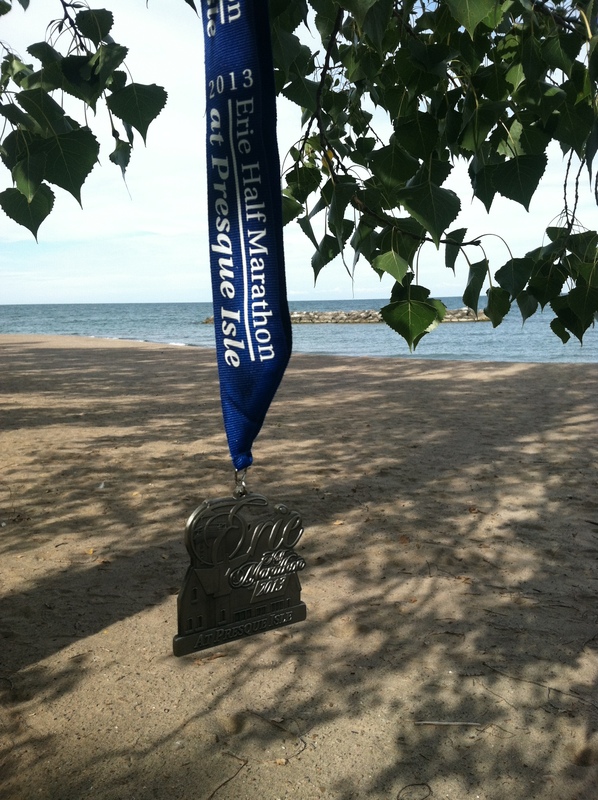 The entire race takes place in the Presque Isle State Park, which is beautiful. The course is heavily wooded, with breaks for nice views of the beaches, bay front, and lake. A special treat is seeing the sunrise over the water. There is no better way to spend a crisp autumn morning. The first mile or so were a bit tough as my ankle was noticeably bothering me, but around the 2 mile mark, I stopped noticing it as much. There was minor discomfort, but once my ankle limbered up, and as long as I did not overdo it with my pace, it was manageable. We knew that it would be tough for spectators to follow around on the course, so I arranged for my family to meet me at the point in the course closest to the entrance to the park (so that they could get in and out without getting trapped for hours). This worked perfectly and they were able to see me twice early on in the race. Easter Egg. One of the hidden gems of this event is the way the race organizers manage their water stations. As a local event, organizers do not have the budget to bring in course entertainment. Also, given the event’s location on a peninsula (i.e., limited access), there are not very many spectators on the course. To compensate for this, organizers encourage community groups who man the water stations to “bring their A game” and entertain the runners. They do this by offering a bounty – at the end of the race the runners are asked to vote for the most entertaining and/or spirited water stations, and the top groups receive additional charitable donations as prizes. This is brilliant. As a result of the incentive, the water stations were filled with enthusiastic volunteers: assorted Halloween costumes; ROTC students in full dress uniforms and honor guards; bands; pre-recorded music; and some of the most excited high school students you have ever seen. This really enhanced my race experience and both the race organizers and the volunteers themselves should be commended for this addition and their efforts. For the rest of the race I just settled in at a nice, comfortable pace, listened to my music, enjoyed being out for a run in the woods, and appreciated the entertainment provided by each approaching water station. The stations were set every mile, so knowing they would appear at regular intervals not only ensured ample hydration, but also gave me something to look forward to. The marathon course is two laps around the half marathon course. My usual goal at a race is to finish the half marathon before the elite runners finish the full marathon, but that was not to happen on this day. With a little over a mile to go, the eventual winner of the men’s full marathon lapped me. This dude was trucking along, and he passed me like I was standing still. It was pretty impressive to see. After that I picked up my pace, trying to leave it all out on the course. I tried sprinting at the finish, but I did not have anything left in the tank, and was happy just to finish upright. The SMO, I was feeling a little artistic that morning. But would you look at the view out over the water? Unexpected Magic. As I crossed the finish line, there was a little boy, probably no older than 5 years old, waiting to place the medal around my neck. As he stood there proudly, I could tell that he really wanted to put the medal around somebody’s neck as he had seen the other volunteers do, and simply handing it to me would not do. Exhausted, my legs aching, and my ankle starting to throb again, it was a real feat to be able to bend over far enough so he could place the medal around my neck. When I looked up he was beaming from ear to ear, and his mother, who was standing behind him, could not have been more proud. It was a real magical moment. For a local race, this is one nice SMO. Not only did the race organizers not cheap out on this one, but they did a good job with it. For starters, the simple, polished steel look of the medal is very nice and enhances the artistry of the lighthouse design. They captured the essence of Presque Isle with the medal design. I also appreciate how they customized the ribbon to the event rather than going with a simple off-the-shelf, plain ribbon. In short, not only do I like this medal, but it will certainly hold its own alongside of the other SMOs on my bling rack. By the end of the race I was pretty wiped out, not only was my ankle screaming at me, but, since I was admittedly undertrained for this race, I was feeling the effects of it. I had made plans to meet my family for breakfast before heading out of town, so I skipped the post-race festivities and headed back to the car to clean up as best I could. The icing was blue? Do you know what that means? The parking lots for the race were the same ones that summertime beach goers use to access the Presque Isle’s beaches. Several people had the same idea I had of using large towels to execute modest wardrobe changes out of their sweaty race clothes. Why do I bring this up? For some, inexplicable, stupid reason, as I was pulling out, two older runners decided that it would be a good idea to change right there by the side of the road, but sans the beach towels. I have never seen anything like this at a race before or since, but, as there were many young kids around, I was appalled that they thought this was appropriate or in any way a good idea. The take away? A large beach towel goes a long way after a race. Bring them. Use them. Will I do this race again? Yup. In fact, I was so pleased with the entire experience that I signed up for the 2014 edition of this race and will be running it in September, but this time I plan on running it on TWO good ankles. Stay tuned for a review and comparison of the repeat race experience in the coming month. 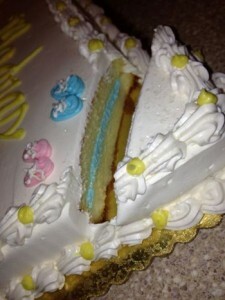 Oh, and if you were wondering…the cake icing was blue, revealing that my sister and brother-in-law were having a boy. He was born in March and he is tremendous. 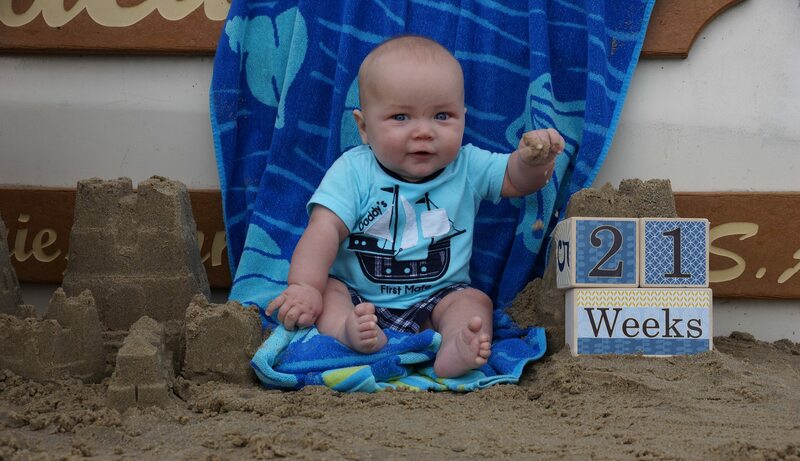 Better than any Shiny Medal Object, meet my nephew, Ryan. 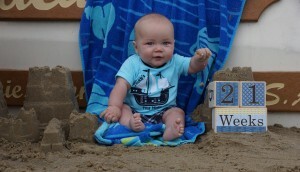 In this picture he is playing in the sand of the beaches of Presque Isle State Park.